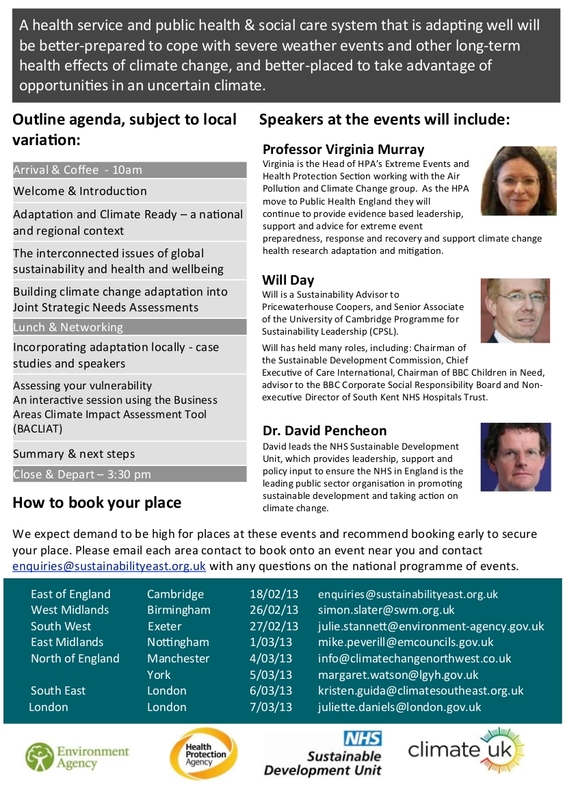 The Environment Agency and Climate UK are hosting free local workshops to encourage integrated strategy-making on health and well-being. 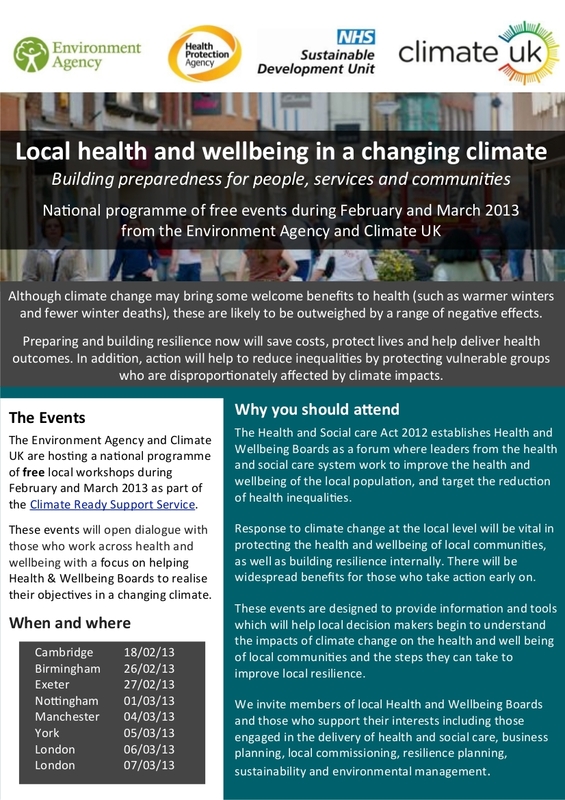 The events will help decision-makers understand the impacts of climate change on community health and well-being, leading to improvements in local resilience. Anyone engaged in the delivery of health and social care, public health, business planning, local commissioning, resilience planning, sustainability and environmental management is welcome. Why is adaptation important to the provision of health and wellbeing services? A changing climate is expected to have significant impacts on human health and wellbeing. For example, the heatwave in 2003 resulted in 35,000 excess deaths across Europe and at least 2,000 premature deaths in the UK alone. The vulnerable groups in our society such as the elderly, young or chronically ill are likely to be worst affected by the impacts – caring for these groups must be factored into planning to meet future demand for health services. Local service planning and design must take climate change evidence and impacts into consideration to ensure that our health infrastructure − hospitals, health care centres, and surgeries − are resilient to extreme events, maintaining business and service continuity. This entry was posted in Adaptation, Manchester City Council, Upcoming Events and tagged adaptation, Genuinely useful things to do on Monday March 4th, Health. Bookmark the permalink.